FAQ: How does an optical oxygen sensor work? The principle of measurement is based on the effect of dynamic luminescence quenching by molecular oxygen. The following scheme explains the principle of dynamic luminescence quenching by oxygen. The collision between the luminophore in its excited state and the quencher (oxygen) results in radiationless deactivation and is called collisional or dynamic quenching. 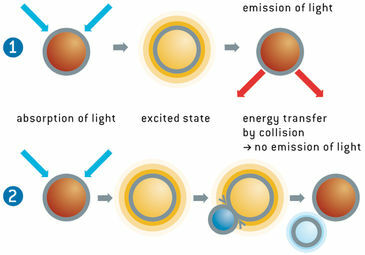 After collision, energy transfer takes place from the excited indicator molecule to oxygen which consequently is transferred from its ground state (triplet state) to its excited singlet state. As a result, the indicator molecule does not emit luminescence and the measurable luminescence signal decreases.